Nothing quite compares with spectacular Rio de Janeiro. Blessed with a wonderful natural setting wedged between mountains and the sea, watched from above by Christ the Redeemer atop Corcovado Mountain, and surrounded by tropical forests and lagoons, Rio de Janeiro has transformed into one of the world's most beautiful cities. A city of 8 million people, Rio offers world class hotels, restaurants, shopping, nightlife, beaches and various sporting activities. 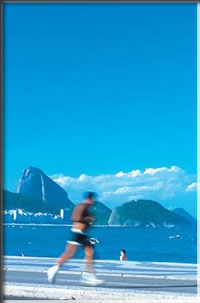 This tour features most of the tours and activities you can take in Rio. You will visit the pristine water and white sanded beaches of Buzios; take a full day trip to Angra dos Reis, cruise to the Tropical Island, take a train ride to the Corcovado Mountain and a cable car to the Sugar Loaf, visit the city, the cultural center, the Tijuca Forest and Copacabana & Ipanema Beaches. You will enjoy the Brazilian rodizio (all you can eat) style on most tours and a Samba Dinner Show. Ideal vacation for singles, couples and families.